Algoma Central Corporation of Canada has cancelled all four newbuild construction contracts with embattled Croatian shipbuilder Uljanik. The shipyard received one contract cancellation for the first ship in early October with the other 3 being aborted at Uljanik’s 3. Maj shipyard days later. The ships in question are self-unloading Handy dry bulk carriers. The quartet, whose market value is estimated at more than $100 million, were scheduled for completion in 2019. These cancellations come at a time when Uljanik is undergoing the restructuring and consolidation process due to a number of financial difficulties it has been facing. Babcock Schulte Energy took delivery of the world’s largest LNG bunkering vessel in mid-October and she departed the Hyundai Mipo Dockyard in Ulsdan, South Korea, for Northwest Europe where she will operate in the Baltic Region. Named Kairos, the 8,090gt and 7,500m3 capacity ship is time-chartered to a joint venture 90% controlled by Hamburg-based Nauticor, part of The Linde Group. Klaipdos Nafta (KN) holds the remaining 10% of the partnership. In addition to her size, the vessel is also notable for her ballast-free design and an installed CNG tanker that stores recovered vapours from the vessels being bunkered. BBC Chartering and Seaboard Marine have entered into a strategic co-operation in an effort to improve cargo movements between the U.S Gulf Coast, Jamaica, and Ecuador, Peru and Chile. The joint venture, to be marketed as Andino Service, was scheduled to begin on 29th November using at least five vessels. Klaveness Combination Carriers (KCC) has named the first vessel in its next generation of CLEANBU combination carriers. The 53,978gt/2018 built Baru was christened at the New Yangzi Shipyard in China on 17th October. The 83,600dwt, 228.4m long and 34.5m beam CLEANBU series will be employed in tanker-dry bulk combination trades with minimum ballast. This new class of vessel will allow KCC to expand its combi-service into the petroleum and petrochemical industry. The CLEANBUs have up to 40% lower CO2 emissions per ton of transported cargo, and go a long way in meeting IMO’s 2050 targets of a 50% reduction in CO2 emissions from shipping. The sisterships will be delivered before August 2020 plus KCC also has fixed-price options to contract a further four CLEANBUs for delivery in 2020 and 2021. Maersk Tankers took delivery of the 29,816gt/2018 built Maersk Cayman, a new MR product tanker, on 26th October. The 183m long/32.2m beam and 50,000dwt ship was built by Samsung Heavy Industries shipyard in Ningbo, China and is the fourth vessel in a series of nine sisters being built at SHI as part of Maersk Tankers’ fleet renewal programme. The Maersk Cancun, Maersk Capri and Maersk Callao were delivered in January, April and July this year. Mitsui O.S.K. Lines (MOL) has taken delivery of the 128,917gt/ 2018 built LNG carrier Marvel Eagle, the first of three vessels intended to transport gas in the U.S.A. The 155,000cbm capacity MOSS-type ship was named back on 5th September at the Kawasaki Heavy Industries’ Shipyard in Sakaide. The ship was ordered in an en bloc transaction comprising two ships in 2014, having secured a charter to transport shale gas-derived LNG from the U.S.A. The third ship of 177,000cbm capacity followed suit in 2015. The Marvel Eagle is employed to ship LNG from the Mitsui & Co.-backed Cameron LNG project in the U.S. state of Louisiana. MOL’s third Sayaringo STaGE type LNG carrier LNG Juno was then christened at Mitsubishi Heavy Industries’ Nagasaki Shipyard in October. Owned by MOL subsidiary MOG-X LNG Shipholding S.A, the 144,828gt/2018 built, 180,000cbm capacity, 297.5m long, 48.94m beam, 11.50 draught and 80,300dwt LNG Juno joins sisters Diamond Gas Rose (named in July and owned by a joint venture of Mitsubishi Corporation and NYK Line) and Diamond Gas Orchid, completed in late June. All three are employed transporting LNG for the Cameron LNG project in Louisiana. The Sayaringo STaGE is a successor to the Sayaendo class, which adopts the apple-shaped tanks and a hybrid propulsion system named STaGE, an acronym deriving from Steam Turbine and Gas Engines. The hybrid propulsion system combines a steam turbine and engines that can be fired by gas. The waste heat from the engines is used to drive the steam turbine, resulting in substantial improvement in propulsion efficiency. Murmansk Shipping Company (MSCO) has signed a major 5-year contract to transport coal produced in the Russian Arctic to Europe via the Northern Sea Route. Vostok Coal manages the development of the massive Taimyr coal basin, home to one of the largest anthracite coal deposits in the world. MSCO described the contract as one of the largest ever related to the transportation of bulk cargoes in the Arctic. Commencing in 2019 when the Taimyr coal production starts, the year-round coal shipments will leave the Russian port of Dikson to ports in Europe. Icebreaker assistance will be required in the winter. 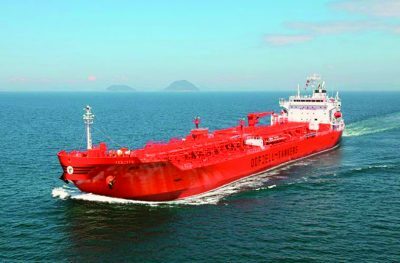 Odfjell SE of Norway expanded its fleet when a new chemical tanker joined the company on 17th October. The new 21,231gt/ 2018 built and 35,155dwt stainless steel tanker, named Bow Precision (above), has 28 tanks and was formally named during a ceremony at the Shin Kurushima Dockyard in Japan. The Bow Precision will be on a long-term charter to Odfjell Chemical Tankers together with a sister vessel due for delivery in January 2019. Following the ceremony, the new ship departed on her maiden voyage from China to Chile. Sovcomflot’s (SCF) LNG powered Aframax crude oil tanker Gagarin Prospect (the world’s first) completed her first voyage across the Baltic and North Seas from Primorsk to Rotterdam on 22nd October when she delivered a cargo of 104,815t of crude oil, marking her first export delivery of Russian crude oil under a long-term time-charter contract between SCF and Shell. The 64,909gt/ 2018 built ship was bunkered by Shell’s custom-built LNG bunker vessel Cardissa prior to embarking upon this voyage. The second tanker in this series, the Lomonosov Prospect, was delivered to Sovcomflot in October 2018 and should be joined by 4 sisters by mid-2019. Reports suggest that China Cosco Shipping Corporation is in talks to take a stake of up to 49% in Sovcomflot, Russia’s largest state-run shipping company. Stena Bulk has signed a turnkey exhaust gas scrubber solution agreement with Chinese company Bluesoul to equip its Suezmax and IMOIIMAX fleets. In total, Stena Bulk will equip 15 vessels with scrubbers and have an additional 6 options for installation prior to 2020. Shanghai Bluesoul Environment Technology, with its base in Shanghai, has had a collaboration agreement with the Stena group for more than a year. Bluesoul is the first Chinese enterprise to be awarded Lloyd’s Register Exhaust Gas Cleaning System Machinery General Design Appraisal as well as DNV GL and ABS AiP. The scrubber type to be installed is an Open Loop Hybrid Ready with Water Cleaning, which not only removes the sulphur but also particles from the exhaust. Other companies such as Scorpio Tankers have placed orders for scrubbers so as to comply with the next emissions deadline in 2020.